More than 40 medical professionals back the Medical Innovation Bill in a letter to The Telegraph. A new law to allow patients to try untested medicines will protect them and nurture medical innovation, a coalition of some of the UK’s most senior health experts say. More than 40 medical professionals, including Prof Michael Rawlins – President of the Royal Society of Medicine and formerly a head of National Institute for Clinical Excellent, back the Medical Innovation Bill in a letter to The Telegraph. The Bill, which will be debated by peers, will make it easier for doctors to try out new treatments on patients without the fear of being sued. Patients will also be able to look up new medicines tried out on other ill people on a new database run by Oxford University and ask their doctors for the same treatments. 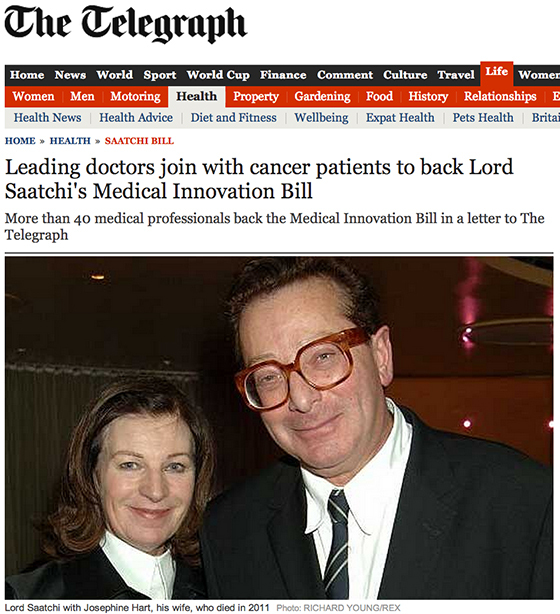 The Bill is being promoted by Lord Saatchi, the advertising magnate who started to campaign on the issue after his wife Josephine Hart died from ovarian cancer. Leading experts who have signed the letter including David Walker, Professor of Paediatric Oncology at Nottingham University, and Riccardo Audisio, President of the Association for Cancer Surgery. Several cancer patients signed the letter, along with Charlie Chan, a consultant general surgeon and Michael Ellis, Conservative MP for Northampton North. In the letter – published to coincide with the second reading of the Bill in the House of Lords – the group said the Bill “legally protects doctors who try out innovative new techniques or drugs on patients when all else has failed. “This Bill will protect the patient and nurture the innovator. It will encourage safe medical advancement, while at the same time deterring the maverick, thereby recalibrating the culture of defensive medicine. The Bill was designed to give the hope to the dying but has since been amended so that untried drugs can be given to those who might benefit. Oxford University has also agreed to set up and run a database containing anonymised information about those who agree to the treatments. Stephen Kennedy, a professor of reproductive medicine at Oxford University, told The Telegraph the database will be “publicly accessible to patients and healthcare professionals alike”. Patients would be able to go onto the website, find an innovative treatment that had been tested on other people and then ask for it to be tested on them. Prof Kennedy said: “There would be a facility within the database to enable people to search on the basis of conditions and treatments.” Patients’ details on the site “would be completely anonymous,” he added. The new law has been criticised by patients’ groups and lawyers. The Patients’ Association said it was concerned that drugs which have only been tried on a few hundred people could put patients at risk. It was also worried about the issue of patients giving informed consent – especially if very ill patients are desperate for any chance of hope. Katherine Murphy, the association’s chief executive, said it was possible “some gung-ho doctors will want to use dying patients as guinea pigs”. He said the Bill “would only require doctors to ‘consult’ colleagues about an innovative treatment. There is no obligation to gain the consent of those colleagues before going ahead”.